An evergreen tree can be decorated for other holidays besides Christmas. This guide is about decorating a Christmas tree. My husband and I stopped by an unusual shop last week on our venture to the next county thrift shops. This sweet lady had a Christmas tree upside down in one corner of her store and had decorations on it. She themes it. This theme was spring with birds, butterflies, different sprays of flowers, and just a beautiful assortment of things. We talked to her for quite a while and found out she redecorates the tree every few months to keep the idea fresh. Her next venture was still being hatched; she said she had several ideas one of which was patriotic. The tree bottom was against the ceiling and I have no idea how she kept it in position, but it was a really intriguing way to display seasonal fun things. I thought I would pass it along as I was very interested in it and I hope this sparks some creativity for you as well. I have many valuable (monetary and sentiment) ornaments that are a bit heavy or fragile. I have sometimes had them to slide off our live tree branches and tumble to the floor. I have been lucky so far with no breakage, but some close calls! Take the decorated clothes pins and clip them to the ends of any branches holding such treasured ornaments. If they do slide, the clothes pins will act to protect them from sliding off! One of the most frustrating things about putting up a Christmas tree is attaching the stand and stringing the lights. A few years ago I came up with the idea of doing it all outside on my patio. Silk Poinsettia clusters tucked into the branches of your Christmas tree is attractive and cheap when you buy them at "after Christmas markdowns." Tips for putting up, taking down and storing tree lights. Post your ideas. 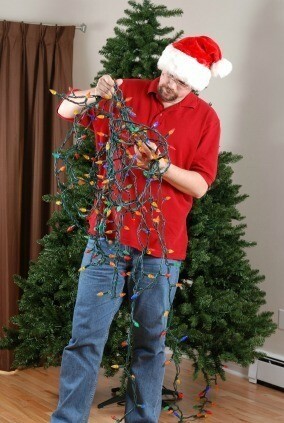 Instead of fighting with strands of Christmas lights to put on your tree, try taking the ones that you buy to put on your outside bushes that are already in one bundle and just throw them over the top of the tree and your done with your lights.No more having to wrap around the tree. I USE AN EMPTY PRINGLES CAN TO WRAP MY LIGHTS.AND THOSE LOOSE BULBS & FUSES GO INSIDE .NO MORE LOST BULBS OR TANGLED LIGHTS. A tip I saw on a craft show was to take the cardboard paper tube and cut a slit in each end (not too long, about an inch). Slide the outlet end into the cut and then start wrapping the lights around the outside of the tube - when you get to the end place the end of the lights into the other slit. It works GREAT! The lights can be stored in one of the new plastic bins they have for wrapping paper and can easily be tested next year. This is a guide about decorating an artificial Christmas tree. Artificial trees have some advantages over fresh ones, especially if they are pre-lit. The actual adding of seasonal decorations, however, is basically the same as with a fresh tree.